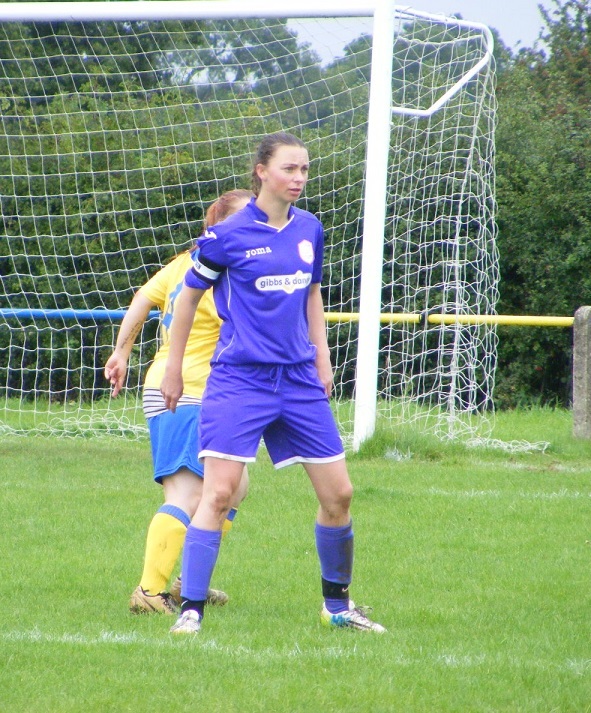 A new season of women's football in Norfolk kicked off last weekend, but this Sunday has the same feel about it as I take a look at two more teams in the county, both kicking off for their first match of the season in Division One as Mulbarton Belles welcomed newly promoted Lynn Ladies to Mulberry Park. A false start for Mulbarton Belles last weekend as they were forced to postpone their opening match of the season due to a lack of players, today as they get their league season under way at last, have just the bare 11 to call upon. Were a newly promoted side themselves the previous season. Hit the ground running with a fantastic start too, were the early season pace setters. Dropped off poorly in the latter half of the season eventually finishing 6th. Has been a rebuilding process during the close season with several players moving on leaving just a handful of last seasons squad have brought alot of new faces in and are looking to recruit more. 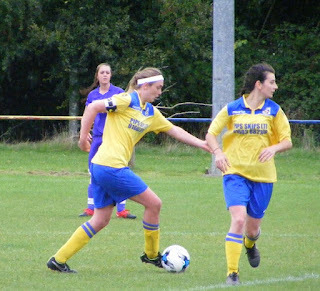 Norfolk Division One is made up of 9 teams this season and Lynn Ladies were originally the side that missed out on an opening day fixture. 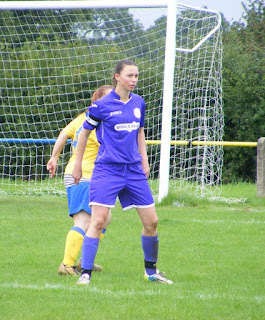 Newly promoted to the top tier of women's football in Norfolk in their debut season since being formed had a strong campaign finishing in 2nd place behind league champions Brandon Town Ladies having been fighting at the top with them all season. Have lost a couple of players from last season, but have recruited too, with 4 new faces in the starting line up today. The venue Mulberry Park opposite the common in Mulbarton is a decent ground featuring a good sized pitch with woodland on the far side with a nice clubhouse across the carpark on the other side. Started off as a pleasant warm day, the clouds were building over head however as the two sides walked out onto the pitch. Mulbarton Belles starting XI - Lauren King, Anna Clarke, Saffron Edwards, Jade Copeman, Leah Walker, Chloe Shaw, Hannah Ewart, Abbie Storey (C), Elodie Ryall-Davies, Olivia Mungham-Gray & Ellie Brown. Lynn Ladies starting XI - Stephanie Lund, Emma Woods, Katie Garner, Millie Wilson, Polly Baird, Vikki Burkauskaite, Leah Hall, Lisa Wilson, Jodie Hopkins, Shelley Woods (C) & Louise Coggles. 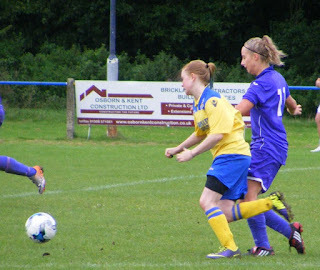 subs - Louise Billingham, Chloe Edwards & Josie Turner. It's Lynn to kick off the match wearing an all purple strip with Mulbarton lined up opposite wearing yellow shirts with blue across the shoulders, blue shorts and yellow socks. The visitors are on the attack from the start taking the ball into the Mulbarton half are awarded a free kick wide on the right, it's Lynn captain Shelley Woods over the ball, plays it in from deep looking to send it in towards the near post area for her team mates to attack is too close to Mulbarton goalkeeper Lauren King who takes a confident catch early on. Woods is playing through the centre in attack for Lynn the ball is driven into her from the middle of the park she lays it out to Jodie Hopkins out on the left, taking her marker on she comes inside pushing to the edge of the box before unleashing a shot Mulbarton's Hannah Ewart intercepts and gets the ball clear of the box. One of Lynn's new faces Leah Hall get's hold of the ball in the middle of the park plays a good pass into the path of Hopkins coming in from the left takes on the shot on the run 20 yards out screws the ball away from goal wide. In the opening minutes Lynn are very much on top driving at the Mulbarton back line as Hall and Polly Baird another new addition to the squad are winning the battle for possession in the centre of the park. GOAL! 10 minutes haven't been played and Lynn take the lead as Hall once again is on the ball drives forwards into the Mulbarton half plays the pass out to Hopkins calling for it on her left, plays the ball into Woods who has come over to the left of the box, shifting the ball between her feet, right to left makes space for the shot, sending the ball across the six yard box and into the back of the net 0-1. An early change for Lynn as Emma Woods comes off having taken a knock, Chloe Edwards comes onto the pitch. Mulbarton attacks have been few and far between early on, have Ellie Brown brought in from the youth set up for her 1st senior start leading the line, has a chance as Mulbarton captain Abbie Storey plays the ball between the Lynn centre backs for her to chase down, sprinting clear brown bursts into the box is to the right of goal as she pulls the trigger drills the shot a foot wide. 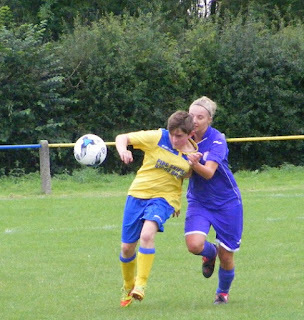 Mulbarton's Elodie Ryall-Davies trying to get the better of Lynn Ladies Leah Hall. Woods is over another free kick wide the right halfway inside the Mulbarton half, plays it long towards the far post, Louise Coggles is there to attack the ball, can't quite get the touch to turn the ball home. Coggles then plays the pass out long to the left with Hopkins chasing it into the corner before sending the cross in across the six yard box, comes through to Edwards who miscues her shot the ball is retrieved by Vikki Burkauskaite another new face to the side, she squares the ball into Woods on the edge of the area, her shot is put straight into King who holds onto the ball. Coggles comes off with Josie Turner joining the attack. GOAL! A light drizzle has started to fall, Lynn's spirits are anything but dampened however as they double their lead. Play is building up down the right of the pitch with both Edwards and Burkauskaite involved, Woods has come across to offer support is given the ball on the right in front of the congested area, works the ball between her feet again before hitting it low and hard across the six yard box and in 0-2. GOAL! Lynn are dominating possession, Mulbarton are struggling to get hold of it and make progress up the pitch, 4 minutes after conceding the 2nd goal a 3rd is scored. Hopkins is causing problems down the left a set play is given away players come up as the ball is played into the box, the initial ball is cleared coming back out to the left Hopkins to play it in again this time it drops invitingly in front of goal, Baird is the 1st to react stretching a leg to stab the ball past King and into the goal 0-3. Lisa Wilson comes off for Louise Billingham for Lynn as the visitors continue to attack Woods on the drive down the left channel fires the pass into Turner in a central position inside the area take on the strike pulls it wide of target. Mulbarton very nearly concede a 4th as King's kick out of her area goes straight to Hall, her defence is caught static as Hall instinctively slides the ball back in behind with Woods making the move to latch onto it entering the area has just the keeper to beat, King stays on her line as Woods pulls the trigger makes the save with her legs as the ball is fired straight at her. A strong 1st half from Lynn, have dominated the possession and have created numerous chances to score taking 3 of them. Mulbarton have been on the back foot which has made it hard for them to get anything going in the final 3rd have done little to test Lynn goalkeeper Stephanie Lund in her 1st competitive start. With no substitutes of their own to bring on Mulbarton make a positional change at the start of the 2nd half with their goalkeeper 1st half, King taking up an outfield position with team mate Chloe Shaw putting on the goalkeepers gloves. It's Mulbarton to get the 2nd half under way. The rain is falling steadily now have given up on packing the sun cream in my backpack long ago such has been the summer never go far without the umbrella though. Mulbarton are looking to pressure Lynn early in the 2nd half with King now looking to offer support to Brown in attack along with Leah Walker and Olivia Mungham-Gray on the flanks. Brown is willing to take players on getting her head down she pushes forwards whips the ball out to Mungham-Gray on the right she plays an early cross low on the diagonal into the area, King tries to make up the ground, not before Katie Garner comes and makes a no nonsense clearance. Woods has covered alot of ground across the front line for Lynn 1st half and is doing the same at the start of the 2nd half as she takes the ball into the right corner cutting it back across the area, misses Turner comes through to Hopkins 15 yards out fires her snap shot wide. Hopkins then has a chance to drive into the area from the left, rides a challenge before Storey races back to slide in and win the ball. Not long before Hopkins has the ball again and takes on the Mulbarton defence gets into the box before sending her shot wide. Out on the right with Woods this time fires her cross into Turner in the centre chesting it down the ball gets stuck between her feet before she manages to dig it out for a shot 8 yards out lifts the ball over the bar. Lynn have a corner on the left the ball comes into the six yard box Baird rises to get her head to the ball turn it goal wards is palmed down by Shaw before 1st half keeper King launches the ball out of danger. GOAL! Lynn net their 4th goal of the match as they pile the pressure onto the Mulbarton defence. Edwards picks up the ball just over the half way line drives forwards, Woods wants it standing on the corner of the area played into her she returns the ball to Edwards continuing her run sweeps the cross along the goal line, Shaw fails to gather as it goes beyond her Turner is their to meet it turning it over the line from half a yard out 0-4. GOAL! A few Mulbarton heads have dropped Lynn keep coming is won deep by Hall she opens her foot to send the ball perfectly into the path of Woods who out paces her defensive marker pushing on into the box lays it back to Edwards making up the ground to support her on the right corner of the box she makes 1st time contact with the ball sending a looping shot in towards goal, with Turner closing Shaw down the ball bounces down between them and in. Edwards claims the goal. 0-5. GOAL! 5 becomes 6 as the team in purple enjoy a real purple patch Mulbarton lose possession inside their own half from a throw on the right is a great through ball that releases Turner coming in from the right is clear of everyone with the keeper back on her line she takes on the shot blasting the ball across goal and into the far corner 0-6. Wilson comes back on for Lynn with Edwards coming off. Woods tries to get her hat-trick in the most bizarre of fashions as a poor Mulbarton clearance presents her with the ball inside the box left of goal, defender and goalkeeper converge on her she goes to ground ending up on her face the ball is loose beside her with a right jab she sends the ball over the line, but everyone and their dog saw it so it's not allowed. Turner wants a hat-trick too as the ball is presented to her inside the box opts for power, too much smashes the shot against the cross bar. Coggles is back on the pitch and looking to get on the scoring act to fires narrowly over the bar from the left of the area as Woods fires a cross along the edge of the area. Brown is still full of running for Mulbarton willing to take players on has good support as her captain Storey wins the ball and looks to take it into the opposition half try and give her side something, putting the ball through into Brown she gets her head down gets past one defender then two a third is too much as Garner comes in to make the tackle. GOAL! It's a 7th goal for Lynn winning the ball back inside their own half the ball is played up the left before being swept into the box with Turner in an advanced position can't get hold of her shot in the middle of the area, the ball though runs through to Wilson on the right of the six yard box she sends her shot back across goal and in 0-7. Shaw sets up a Mulbarton attack as she holds onto a long range Lynn shot and quickly releases it launching a powerful kick forwards with plenty of distance sends King in beyond the Lynn defence as she enters the box takes on an early shot sends the strike sails over the bar. Woods keeps the ball in on the right squares the cross along the face of the box, racing in Hall misses her kick, the ball rolls through to Coggles she gets plenty behind the shot firing the ball wide across the face of goal. GOAL! An 8th goal for Lynn and it's Woods to compete her hat-trick (legally this time). Is out on the left side of the pitch when the ball is played into her, drives forwards with the ball at her feet pushing inside through into the area opts to hit the shot low and hard along the face of goal the ball nestling into the far corner to make it 0-8. That's it 8 goals for Lynn Ladies to open their league season with a convincing win away from home were strong all game with the players available from the bench to keep the energy in their attack for the whole 90 minutes a confidence boosting start to life in Norfolk Women's Division One. 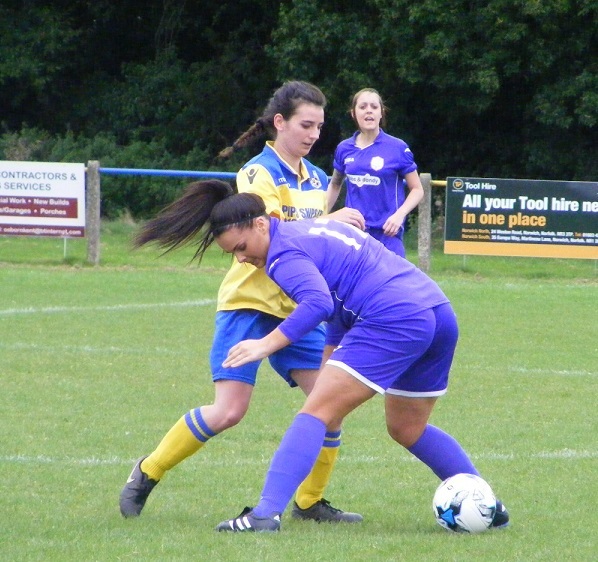 Far from the start Mulbarton Belles would have wanted a tough start to the season but have hardly had the best preparation bringing in alot of new faces, only natural heads will drop as the goals conceded grew. One game have to pick themselves up go again. Both are in action again next Sunday 20th Sept, with Mulbarton Belles away to local rivals Long Stratton Ladies and Lynn Ladies at home to Thorpe United Ladies. My thanks to both teams for the help with the teams today wish both the best of luck for the rest of the season.